If you’ve ever smelled musty, moist carpets or stepped on wet carpets, then the answer is obvious. 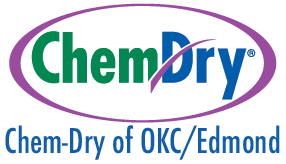 You need Chem-Dry of OKC/Edmond and our unique, effective carpet cleaning that dries quickly. We use a patented Carbonating Cleaner that is applied using a low pressure spray machine, covering your carpet with millions of microscopic carbonated bubbles (instead of tons of water). These tiny bubbles explode dirt and grime from the fibers of your carpet and raise them to the surface where they’re easily extracted and cleaned away. With our carbonated cleaning method, we’re able to use far less water than most steam cleaners. That’s why carpets cleaned by Chem-Dry are dry in only 1-2 hours instead of days.